Learn more about features and services available to Tesla Owners through Tesloop’s Carmiq network. “Xena is dead,” reported our operations manager. Xena is a Tesla Model 3 which had been parked overnight at the Tesloop office. It showed over 60 miles of range when it arrived. How could this have completely drained by the morning? For a variety of reasons, as we learned. In this post I will share what the Tesloop team learned about caring for Tesla batteries, and why we’re building vehicle monitoring that will make owning an Electric Vehicle (EV) better. Based on our experience driving over 2,000,000 miles we believe Teslas are the best electric cars, but all EVs run on batteries. In spite of the growing popularity of EVs, there isn’t much in the way of practical advice about battery health. At Tesloop we came to know our batteries, and know them well. We personified our cars with fun names, so we could ask questions like, “Is Duke’s range still better than Ruby’s?” Charging your EV several times a day creates plenty of opportunities to observe how fast it charges and how well it holds a charge. We learned there are some good basic guidelines to follow to get the most from a battery pack. The first Tesloop car is a 2015 Model S 85D that now has over 430,000 miles on the odometer. That car lost 6% of its original battery capacity or about 20 miles of rated range in its first few months in operation as previously shared. That is worse than typical, as reported by Eletrek. We learned our battery’s degradation was largely due to charging to 100% of capacity multiple times per day between Los Angeles and Las Vegas. The distances between the Tesla Supercharger stations along that route made it necessary. Tesla has built more stations since, allowing for several quicker charges en route. Changing to a practice of keeping the Charge Limit set at 95% slowed the rate of degradation to nearly nothing. That was reassuring, but over-charging is not the only cause of loss of capacity. That same Model S had its battery replaced twice. The first replacement you can chalk up to our naive charging enthusiasm. The second was a defective battery. We noticed a sudden increase in the rate it was losing capacity and knew something was wrong. As you can see in the chart below, the loss rate was highest in the last week of August and the first week of September 2017. The battery lost 6.4% of its capacity in those weeks. That is approximately the same loss we saw in the first 194,000 miles, all gone in only 4,500 miles. The battery capacity ultimately dropped 15%. What happened? To put this in perspective we compared against the rest of the Tesloop fleet. All other vehicles displayed slow loss of capacity due to frequently fast charging to enable driving around 600 miles per day. The data show variations across vehicles, but also within each vehicle’s range due to differences in usage or dynamic allocation. The cluster towards the top of chart (highest rated range) is 2017 Model X’s. The two lower series are 2016 Model X’s. It is important to note that the vertical axis doesn’t start at zero in this chart as we would typically do to show the magnitude of changes on a consistent scale. Instead, we have “zoomed in” to more easily see the relative change. 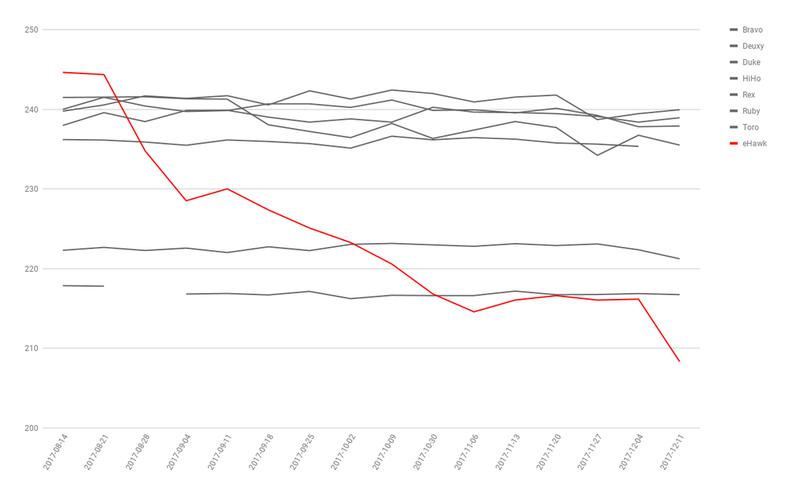 You can see that eHawk’s rated range was the highest in the fleet, making the decline all the more dramatic. This type of battery pack failure is extremely rare, but it does happen, and we wished we had caught it sooner. That’s when we decided to create battery health monitoring. We are building Carmiq as open source software to provide the needed vigilance, and more, for everyone, for free. Returning to our dead Model 3 - the battery pack wasn’t the cause. This was not a case of the dreaded “phantom drain”, which has been well covered by Teslanomics. Tesla Service reported the battery pack tested fine. It was the touchscreen incorrectly detecting a “phantom touch.” The defect caused the air conditioning system to stay running all night draining the remaining charge in the battery pack. You can see that battery monitoring can save the day, even when the problem isn't with the battery pack. Following general guidelines for charging helps avoid some issues. Beware, though, you will receive conflicting advice from different sources, just as we did. That is why the best and most accurate insights can only come from analyzing your vehicle's data. Doing so proactively, before an issue manifests, makes all the difference. Like insurance, battery monitoring is a service you need to have and hope not to need. Insurance can be improved through connected car data too, but we’ll save that for a future post [subscribe]. Also like insurance, battery monitoring works better the more people that have it. The more vehicles, the more data, the better for everyone. Since posting this blog, we’ve released several data insight features on Carmiq. Access to this information and visuals are free, all you have to do is connect your Tesla vehicle to Carmiq. A few features require 24-48 hours of connection time to calibrate a proper result. The calibrations will become more accurate over time with historical data. The screenshot provided below is what is currently available on Carmiq, but many updates to current features and new features are being planned and worked on.